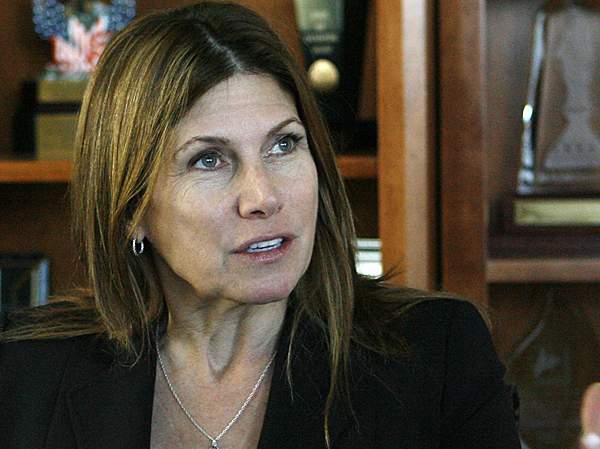 Prescription drug abuse is an issue dear to Mary Bono Mack's heart. To be sure, I don't agree with her on all the issues nor do I endorse the same politicians she does (I usually don't get political on my blogs, unless an issue address the concerns I have about the world). More about that in a future post. Be that as it may, she does a tremendous amount of work to get people who abuse prescription drugs help. I discovered that when I read an article about Mary Bono Mack's fight to help those who are addicted to prescription drugs. I know her pain. I have had the same issues in my own family that are closely connected to the controversy this issue has become . Tomorrow, would have been my brother's birthday (Dr. Norman Bamberg), but his life was given up. During the most recent part of his thirty-year medical doctor career he was a pain doctor. Much has been written about the association of pain doctors and the prescriptions they write. Bono-Mack's solution doesn't deal with a throw-everybody-in-jail approach. Instead, she seeks to enact laws that make drug companies responsible for the pain relief drugs that they make. Recently, she advocated for making it very difficult to physically change pain pills so it can they used for other purposes--mainly to get high. That certainly would help legitimize the business of pain medicine. To be sure, many people have pain that deteriorates their quality of life. Thank you for your personal story regarding the abuse of prescription drugs. It is good to hear from you, and I appreciate your patience while awaiting a response. As your Representative, I have been leading the fight in Congress against the fastest rising drug problem in America – the abuse of prescription drugs. According to the Centers for Disease Control, drug overdoses, including those from prescription drugs, are now the leading cause of preventable deaths in the United States. It is clear that Congress needs to take steps to address this critical problem that has devastated families all across America. In an effort to raise awareness about this important issue, I serve as the co-chair of the Prescription Drug Abuse Caucus in the U.S. House of Representatives. In addition, I have introduced the Stop Oxy Abuse Act of 2011, (H.R. 1316). I introduced this legislation to help stop the rising abuse and addiction of prescription drugs containing controlled-release oxycodone hydrochloride, included in the popular pain killer OxyContin. Over-prescription and drug diversion can have devastating effects on families and communities across the country, too often leading to addiction, criminal activity, and even death. Far too many young people are falling prey to the highly dangerous and addictive drug, OxyContin. I also introduced the Ryan Creedon Act of 2011, (H.R. 2119) which would put in place new measures to ensure that prescribers of powerful pain medications receive a minimum standard of education before issuing the drugs. No such national standard currently exists. It is important that the citizens of our district keep me apprised of their views so that I may better represent you in Washington. Rest assured, I will keep your views in mind when this issue comes before the U.S. House of Representatives. Again, thank you for taking the time to write. For your convenience, you can sign up to receive regular email updates from me on issues important to our district at www.bonomack.house.gov/emailsignup. Please feel free to contact me on other matters of mutual concern. Mary Bono Mack is running for congress in our district, which is the 45th. The congresswoman has a long history in the chamber. She's been serving since 1998, when her husband who was serving in the position Sonny Bono died in a ski accident. Her opponent is Dr. Paul Ruiz. More about his views tomorrow. Bono Mack is considered a moderate Republican. She's for the multistakeholder governance model for the Internet. (Did you know that there was such a thing?) Stakeholders are businesses, civil society, governments, research institutions and non-government organizations to make decisions about goals and challenges that face it. She voted to extend the Bush-era tax cuts. She voted not to prohibit use of federal funds for Planned Parenthood. She voted against Obama's new offshore drilling use plan. She voted for the authorization of the federal government to share cyber threat information with private-sector entities and utilities. She voted for passing a bill that repeals certain Department of Education regulations. She voted against requiring public disclosure of bonuses and Golden Parachute arrangements. She voted to suspend the cross-state air pollution rule. She voted for monitoring the air quality impact of oil drilling. She voted for school vouchers for Washington D.C.
She voted to repeal Don't Ask; Don't Tell. She voted for Prohibits individual states from recognizing marital status and/or legal benefits from any other unions other than that of a man and a woman (2006; bill failed). Palm Springs Home in the Las Palmas neighbohood. Not another guess who this person is, but, instead, guess whose home this is. Just to inform you that I can't recall what star lived here. It was taken about a year ago when a friend of mine was showing me the stars' homes. Move over mid-century modern, there's a new interior design for the desert city--Southwestern filled with saturated color and brighter than ever before. 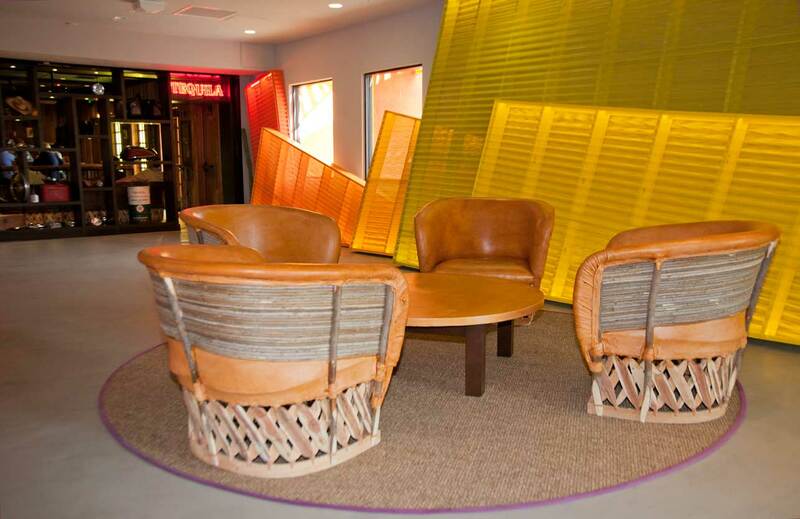 If you enter the lobby of the Saguaro Hotel at the south end of the city, you'll find saturated colors throughout, including sunshine-colored background rippled panels that match the amber wicker chairs. To be sure, the mid-century concrete floor is there instead of tiles, matching mid-twentieth century design, which consists of floor-to-ceiling glass and concrete among minimalist furnishings. Why would the Saguaro do that? It surly has to do with chain's other hotel by the same name in upscale Scottsdale, which is run by Joie de Vivre Hotels. If you've ever been to Scottsdale, the place is nothing but Southwest design. Inside and out, the Saguaro bucks the mid-century architecture majority that lines the big mountain from its blasting, colorful exterior to the Southwest flavor of the interior. Is this new Southwest design in Palm Springs a thumbs-up or a thumbs-down? 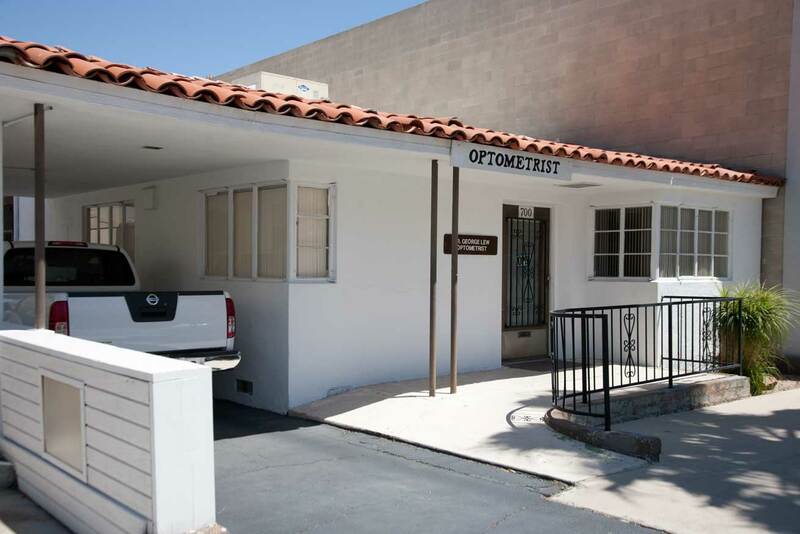 Cute little optometrist office right in downtown Palm Springs. 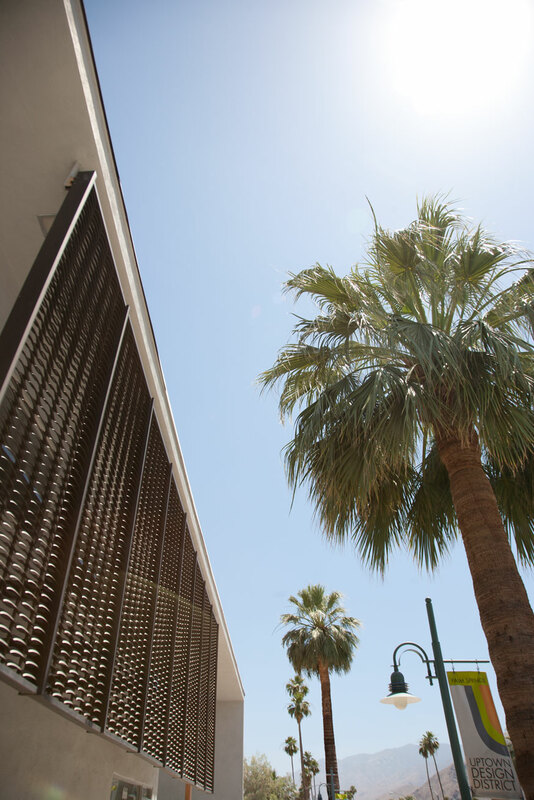 Palm Springs is a real mix of Spanish and mid-century modern architecture. 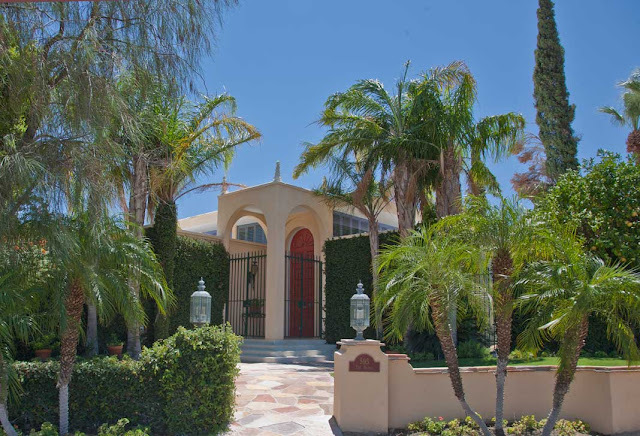 Much has been written about the mid-century buildings and landmarks in Palm Springs--not as much, though, about the beautiful Spanish architecture here. A red tile roof is one of the only materials in construction that looks better the older it gets. It seems to last forever, and when it does start breaking down the tiles loose their luster, which brings a more deep red color and enhanced texture to it. One thing is for sure, polished tile doesn't photograph all that well in strong sunlight, not like tiles that have tested the ticks of time. 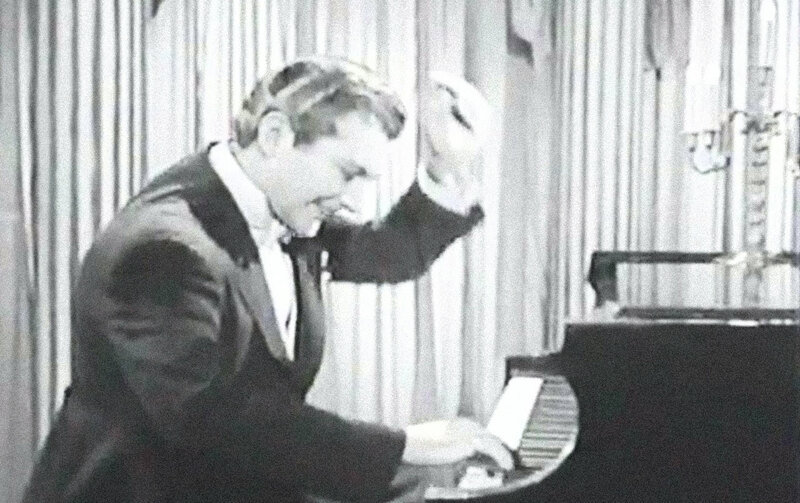 Can Michael Douglas, the star of a new HBO movie about Liberace soon to be filmed in Palm Springs, play the piano? Just two years after the Liberace Musuem closed in Las Vegas, filmmakers are again bringing him back to life with all the drama and fanfare in a new movie where Matt Damon plays Scott Thorsman and Michael Douglas, Liberace himself. Liberace lived in Palm Springs, hence the movie will film here next month. 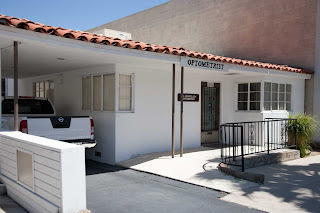 The last time I wrote about Liberace was when I photographed Liberace's house in Palm Springs. The showman's primary relationship was with Scott Thorsman, who wrote an epic biography about the time he spent with him. The biggest question about the entire fiasco is can Michael Douglas play the piano? Indeed he can as a quote from Catherine Zeta Jones, his wife said in an article by Jspace.com: “As Michael always does, he throws himself into it 125 percent, so he's playing the piano. I've sent him off to the guesthouse because I can't stand it." Grapes in the Coachella Valley? Who knew that you could grow grapes in the Coachella Valley. I certainly didn't until I drove out to photograph the date farms and stumbled among grape farms in between the tall date trees. Mind you, these aren't grapes that are used for making wine like those in Napa Valley and Temecula, these are table grapes that you can eat right off the vine, and, yes, I tried a few and they were deliciously sweet. The biggest surprise I found that some of the grapes had dried into raisins on the same vine, which were also very tasty. 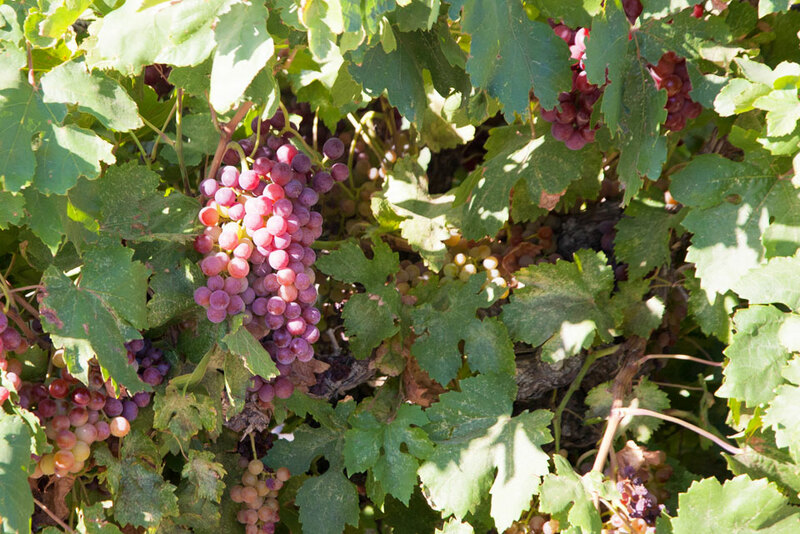 In Coachella Valley the grapes are dried into raisins during the hot summer. They are harvested as a process known as gunny sacking, which is in process right now. As temps approach 120 degrees in Palm Springs, one can wonder if there really is global warming . A heat wave like this is normal for us, but what about the rest of the country? Hot has been the name of the game; the heat plus the humidity makes it ten times worse than what we have here. People in Palm Springs are used to it. You just stay inside until the sun goes down behind the mountain. While you're there a book titled Heat Wave is a great read for these doggy summer days. The only real time to go out and get a little fresh air is to get up at the crack of dawn (for those who prefer a temp of 88 degrees over 107 degrees, the temp when the sun goes down behind the mountain) for a walk or bike ride. Do this every day and you'll find the same people doing the same thing day in and day out. Just about everyone offers a friendly "hello." Hope to see you out! What in the world is this? Who has ever heard of tuxedo chairs? This pair ended up finding a temporary home in a La MOD, a Palm Springs mid-century store. My only wish is that I could have gotten a couple of guys together wearing tuxedos to christen the chairs. 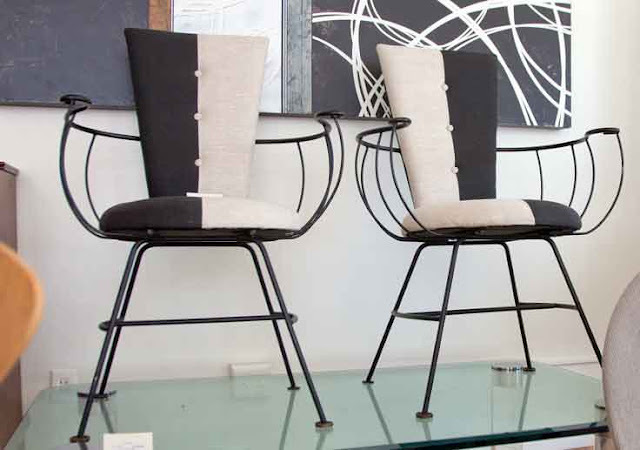 You just gotta love the wrought iron and buttons that accentuate the chair's design. The real question is: Are they comfortable. My guess is no more uncomfortable than a tuxedo. After living in Palm Springs for a little over 12 years and seeing enough mid-century modern furniture to recognize the designers who crafted them, my eyes have never set their eyes on these gems until now. Gee, I didn't even know such things existed. Yesterday, I experienced a bit of tiki madness, spending hours on end working in Photoshop to merge three negatives, each with a part of one giant tiki. This tiki is no ordinary sculpture. It was carved and painted in the 1960s. About ten years ago, there was a the Tiki Spa was fenced in, a vacant property begging to be saved. In the front of the building there was this (image to your left). Some people have wondered what the tiki in front of the Tiki Spa looked like. So, here it is--a fine piece of art that I got to capture before it was hauled away. This has to be the coolest tiki ever made in Palm Springs. Anyone know where it is now? My guess is it ended up in the dump. After I shot the tiki, I recall calling the Palm Springs Preservation Foundation (it could have been another organization though, as I'm having a tough time remembering). I let them know that there was this giant tiki on the fenced-off property. I don't think anyone listened. I decided to dig out the old negatives of this because another artful tiki I had messed around with just sold on Fine Art America. Just in case if you don't know what this was made from, I'll give you some clues. It's a tree that grows abundantly all over Palm Springs. I also wrote about this kind of tree in my last post. Can you guess what it's made from? Click the comments button to tell. 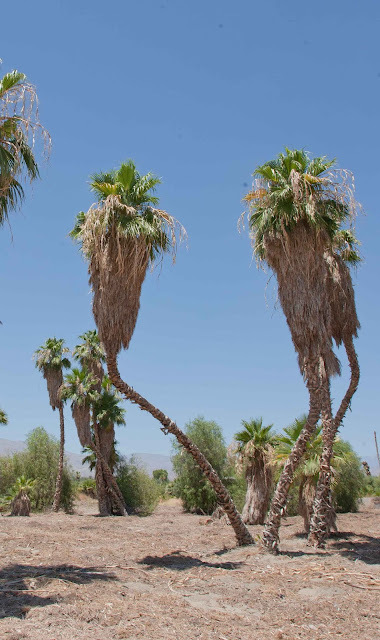 There are some weird crooked palm trees in the Coachella Valley. These are out in the farmlands of Indio. I think they should be transplanted into a spot off Palm Canyon in downtown Palm Springs. The tourists would love it. It's the same kind of curve you'd see in a coconut palm in Miami. Something like this should replace the Marilyn statue when its time is up. These types of palm trees are called Washingtonia Robustas or Mexican Fan Palms. As nice looking as they are, touching the base of the tree frond will result in a puncture wound. The razor blade sharpness of the thorns can penetrate deep into the skin. This time of year the trees bloom. Gardeners are busy climbing up them to trim off the fruit and bottom fronds. If you look around the trees look now look as if they've been given a crew cut. When left to grow on their own without human intervention, the skirts of the trees are thick with dead fronds. This is what you see hugging the trunk under the green fronds. The tiny edible fruits are good snacks for bird and rats. Humans can eat them too, but the amount of fruit wrapping each seed is minimal.